The National Radio Company had a 77 year history, from 1914 through 1991. 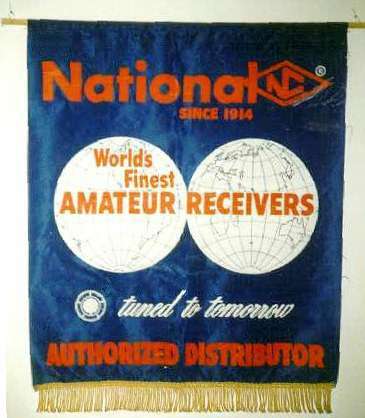 This banner reflects their late 1950s emphasis, "World's Finest Amateur Receivers ... Tuned to Tomorrow". National Radio was first incorporated in 1914 as the "National Toy Company". By 1916 they had broadened their product line to include household goods so they changed their name to the "National Company, Inc." They got started into radio in the early 20's. The Cardwell capacitor representative in the Boston area, George Q. Hill, found that he could sell more capacitors then the Cardwell could supply. National began to supply him capacitors at this point. They sold all that they could manufacture. By 1923 the National inventory included trade marked toys, Magnetic Dancers, Roberts Mixers, DMB Covers, Victrolene, and radio components. (If anyone has found any items from these earliest years of National, I would like to hear about it). In 1924, two engineers from Harvard University, Fred H. Drake and Glen Browning, did some analysis that indicated that the typical RF transformers of the day were too tightly coupled for best performance. They approached National to manufacture components to their specifications. The National Regenaformer kit for home construction of the Browning-Drake Receiver was the result of this relationship. The circuit was basically a neutralized tuned RF amplifier followed by a regenerative detector. National provided the coils, capacitors, knobs and their famous "Velvet Verniers". It was designed for the broadcast band, not for short wave reception. Based on this introduction to radio, National made the design, manufacture and sales of radio equipment their principle line of business. By the early 30's National had established a reputation with the amateur radio community based upon their line of regenerative receivers including the SW-3 and SW-5. In 1933 they introduced the FB-7 receiver. This was a cost reduced design based upon National's earlier AGS (Aeronautical Ground System) receiver developed for the CAA (known as the FAA today). The RF preselector was made an optional accessory, the case design was simplified and only one set of coils was sold with the receiver. Even the power supply and tubes were extra cost items. Later, National made available a crystal filter that could be installed by the buyer. It was a popular receiver with the cost conscious ham of the 30s. In the early 30s National started exploring the potential of the VHF bands. The SRR (Super Regenerative Receiver) was one of their first products for the VHF spectrum. The superregenerative circuit was characterized by high sensitivity. Only one stage of audio was required for loud speaker volume. The regenerative detector was run with heavy feedback broken only by the quench oscillator built into the circuit. The SRR was sold as a VHF/5 meter radio but coils were available for the lower frequency HF bands. On these frequencies it would work with the quench oscillator disabled as a straight regenerative detector plus one stage of audio. Again, National was marketing to the cost conscious ham that wanted one radio that could be upgraded to fill multiple roles. National's courting of the VHF enthusiast continued with the introduction of the 1-10 in 1938 followed by the 1-10A. These superregenerative VHF receivers were sold with coils covering 1- 11 meters (27MHz through 290MHz). They incorporated the HRO style dial and acorn tubes in the RF and detector stages. In 1935 National introduced their top-of-the-line HRO receiver. This radio included two RF stages and a crystal filter. The distinctive HRO dial allowed KC (KHz) resetability and was a National trademark into the 60s. With few changes other than to keep up with changing tube technology, this same basic design survived for over 20 years. National made a brief foray into the transmitter market in the late 30s. Primarily these transmitters were marketed as drivers for amplifiers built from National components. The NTX-30 is one example. It was designed with a 6L6 oscillator running on 80 meters followed by push button selectable multiplier stages for output on 40, 20 or 10. The final was a pair of 6L6s paralleled to run about 60 watts input. It was also available as the NTE with a speech amplifier replacing the 6L6 final. One of National's final examples of state of the art innovation was introduced in 1965. The HRO 500 was an all transistor, fully synthesized receiver covering 5KHz through 30MHz in 60 500KHz bands. The HRO style dial is direct KHz readout. No longer was a conversion scale or chart required. Upon it's introduction, Popular Electronics Magazine reviewed it as possibly the best amateur receiver ever. My particular HRO 500 was built in 1977 and was sold as an example of "when you have a winner, stick with it". National's ham equipment lineup throughout the 30's reflected innovative electrical and mechanical engineering. They successfully answered the needs of the hams of the day to become a household name throughout the 40s, 50s and into the 60s. In the 70s and 80s National survived as a government contractor. No longer did they develop and market gear for the amateurs of the day. In 1991 the last of this company disappeared in a final foreclosure auction.